I have to admit that I find this coming television season to be a bit of let down. 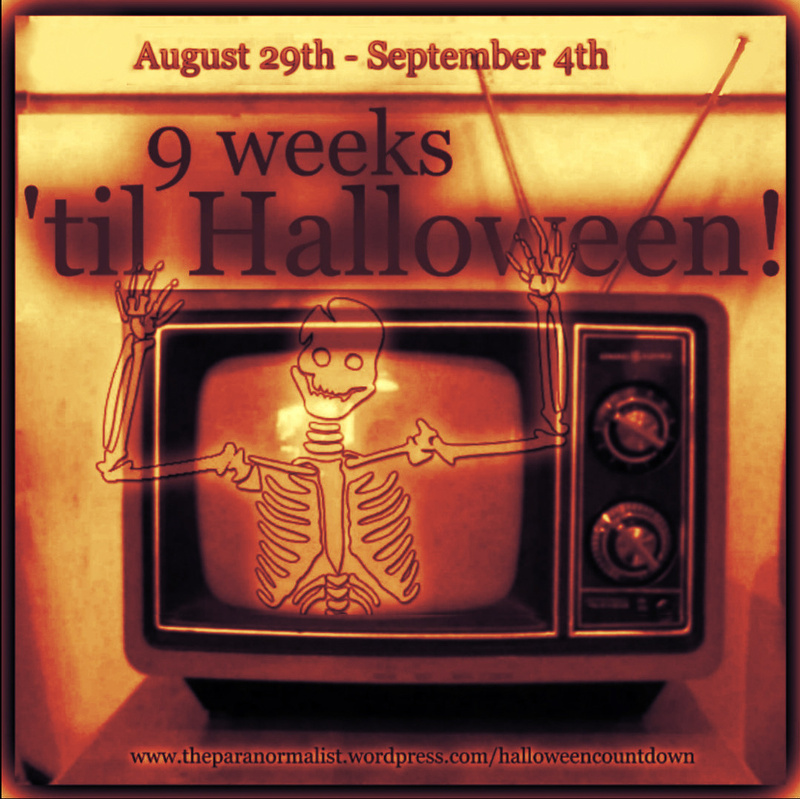 I’m not seeing many new shows in the macabre, mysterious, or paranormal vein. Still, there are some intriguing newcomers, and some of my favorite shows are chugging along nicely. As I assembled this list, I noticed there are a number of series out there that I gave up on in their early days … in past seasons, when there were just so many options to choose from. Considering the fact that these shows are still getting renewed, I may have been wrong to jump ship so quickly. Please let me know which, if any, of the shows I’ve marked as blue deserve a second look. Orange = Have watched. Recommended, with reservations or cautions. Green = Have watched. Recommended. A good show that lives up to its reputation. Blue = Used only on special edition lists, like this one. It means I do not watch the show, and feel neutral about it. I probably sampled it but didn’t stick with it … which in itself says something, I suppose. Disclaimers about my selections: I highlight shows that appeal to me, and shows that I think will possibly appeal to the readers of this blog, as I understand them. Providing a guide to ALL the new shows is beyond me. 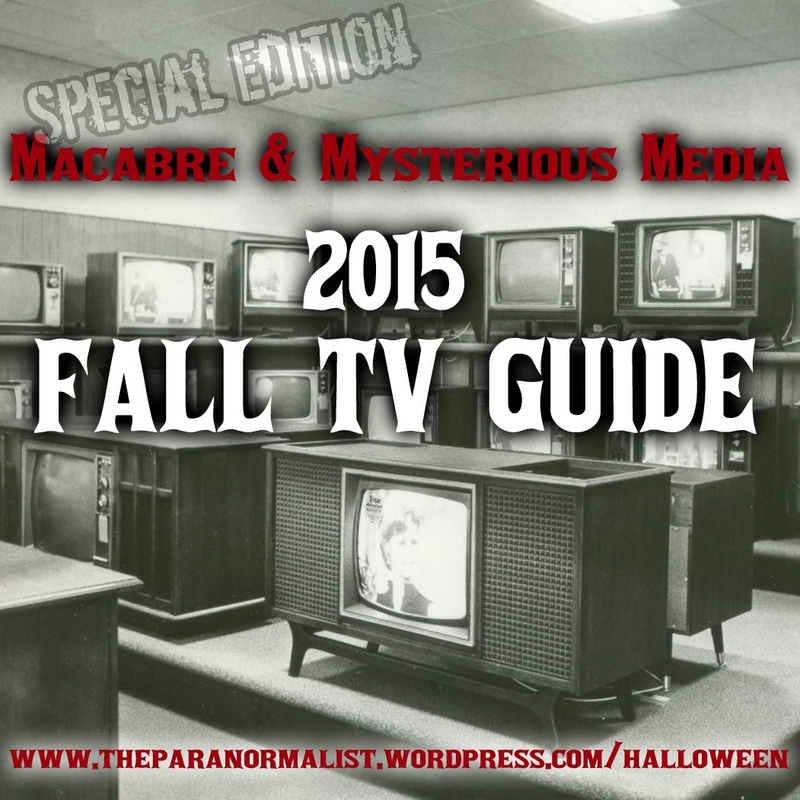 Here you’ll find television that has a paranormal, gothic, fantastic, and/or mysterious flavor. (I don’t watch much in the way of personality-based reality and/or investigative shows like Ghost Hunters or Paranormal State. Documentaries are another story entirely, but I’ll save those for another post.) Warning: I also have a taste for certain shows with a historical or retro flare. Information about how the list works: I’ve included the premiere dates for new AND returning shows that are likely to appeal to my readers. (But I don’t watch them all.) For returning shows, I’ve researched the availability of past seasons, just in case you think you maybe made a mistake in the past by not making room for a particular show. (I know I regret not watching Grimm from the beginning.) I provide video trailers ONLY for new shows. The premieres are listed in the order in which they will arrive. I may add a few that will be coming after Halloween, but right now I just want to get this monster up and off my plate for a while. Tips: If the series has specific page provided by the network, I’ve linked to it with the word ‘homepage’. If a series has past seasons available via Netflix, I’ve linked to the appropriate listing, to simplify your queue management. PS: There is A LOT of information, including links and other moving parts, in this post. If you notice an error, or click something that doesn’t work, PLEASE let me know so I can fix it. I just couldn’t get through a 10th quality check. Season 1 available on Netflix streaming. 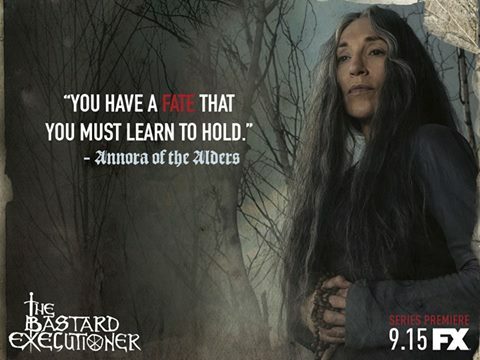 Episodes 1 & 2 are available on SyFyNOW. Who out there has been watching? Did I miss out on a good series here? It looks like I could catch up pretty easily. 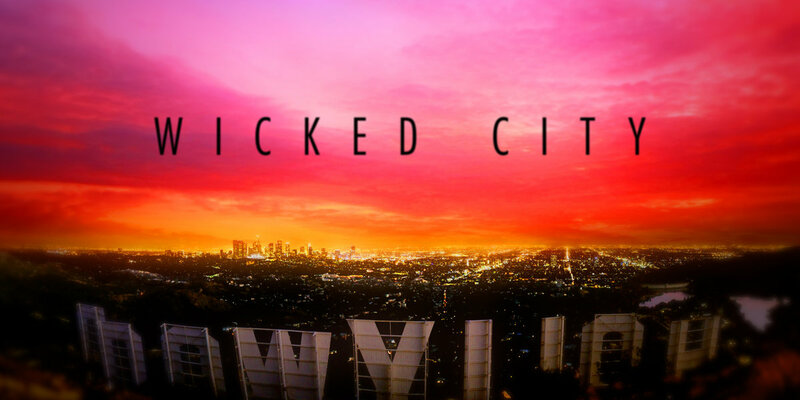 The pilot episode is available here … if you can “sign in to a participating TV provider.” This new series is by the folks who are responsible for Sons of Anarchy — which I haven’t watched, but hear good things about. I’m sorry I missed giving you a heads-up on this one. NBC doesn’t appear to be providing a way to watch the pilot, if you missed it. It is available On Demand on my TV provider’s system, so check yours. Apparently, this isn’t faring well with reviewers, but I have to tell you I LOVE it. I had to get through the first 2-3 episodes before the bug really bit me though. This is one returning show I’m genuinely excited about. This isn’t the sort of thing I’d normally share, but I’ll be watching it, of course. It might put my experiences at the Paranormal Hotel into perspective. I can’t say I’m super-excited about this one, but I’ll give it a shot. I don’t generally like horror comedies, but this a SLASHER parody, and I might be able to get into that. I do like Jamie Lee Curtis and Emma Roberts. This is clearly more crime drama than paranormal, but: New Orleans (!) Scott Bakula (!) & Lucas Black(!) <- that was last year’s note. I watched the first several episodes of season one, but it didn’t capture me the way I expected it to. NCIS is no CSI. All 4 seasons of the original series are available on Netflix streaming. I was enthralled back in 2006, when season 1 aired. (Save the cheerleader!) After that? Not so much. I drifted away. It would be hard for me to pick this up, I think, without watching the whole first series through. (But that’s just me. I’m sure they are starting it so that an all-new audience will get the big picture.) Aw, who am I kidding? I’ll probably give it a try. Tried it last year, but found it annoying and hard to follow. I thought it would be cancelled mid-season, but here it is, renewed for another year. I wonder if I gave up too soon. Did it even out eventually? Seasons 1-4 are available on Netflix streaming. This is one I intend to marathon one of these winters. I wasn’t paying attention back when it was getting started. Since then, I’ve just always felt too far behind to catch up. Season 1 & 2 are available on Netflix streaming. I wanted to love this, because Joss, but I found the characters to be totally lacking in appeal. I couldn’t connect with any of them. After 5-6 episodes I gave up. It seems to have some staying power, so maybe I (once again) gave up too soon. Perhaps this one will be marathoned in the future too. 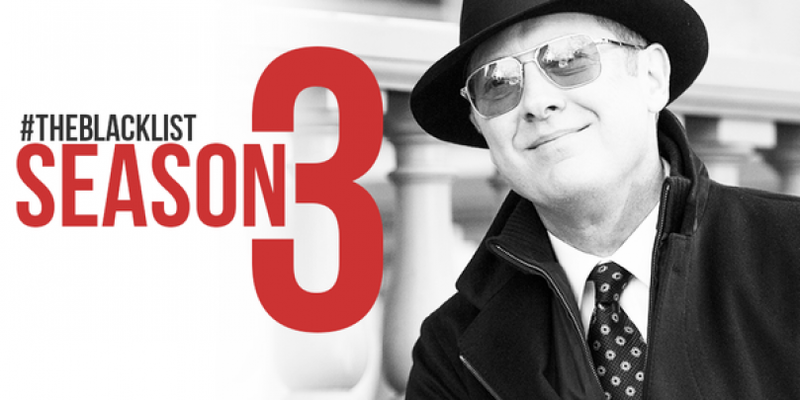 Adored Red, didn’t mind Liz, and enjoyed the episodes where the focus was on catching a bad guy … but the through-plot bored me. I haven’t abandoned this show yet, but I’m not eager to go back for it either. Tried it. Found it to be so firmly directed at a younger demographic that I slunk away, feeling like Rip Van Winkle. In order to be lured back, I’d have to hear (from someone older than 30) that the show became AMAZING after the first 3-4 episodes. First 3 seasons available on Netflix streaming. Seasons 1-5 are available on Netflix streaming. Yet ANOTHER show I think I missed out on. Likely to be a future marathon. The only question is when do I pull the trigger on the start pistol? AMC is pretty great about doing marathons before a new season begins … keep an eye out for season 5. 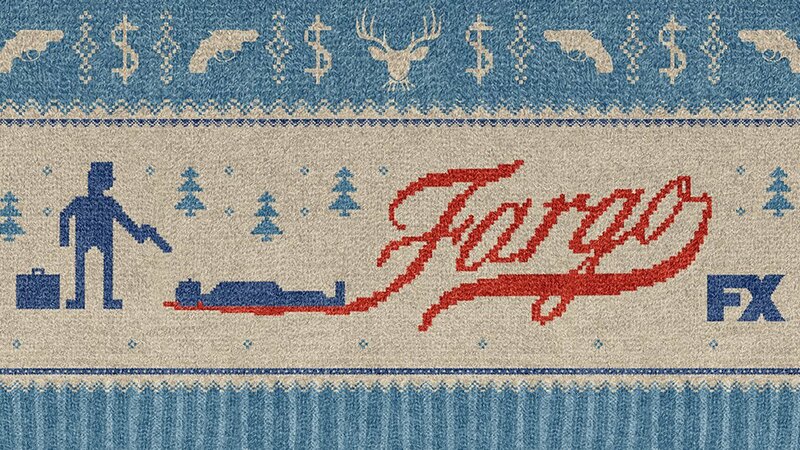 I know this is an outlier, but the first season of Fargo, which is only tangentially connected to this season’s, was perhaps my favorite show of last year. Now, maybe, that’s because I’m a Minnesotan myself, but I think it was more than that. It was just chock full of stellar performances and subtle, brilliant writing. (Despite the funny accent … which I DO NOT HAVE.) This year, we get Patrick Wilson, Kirsten Dunst, Jean Smart, and Ted Danson in lead roles. That’ll be real good, ya know. Seasons 1 & 2 are available on Netflix streaming right now. 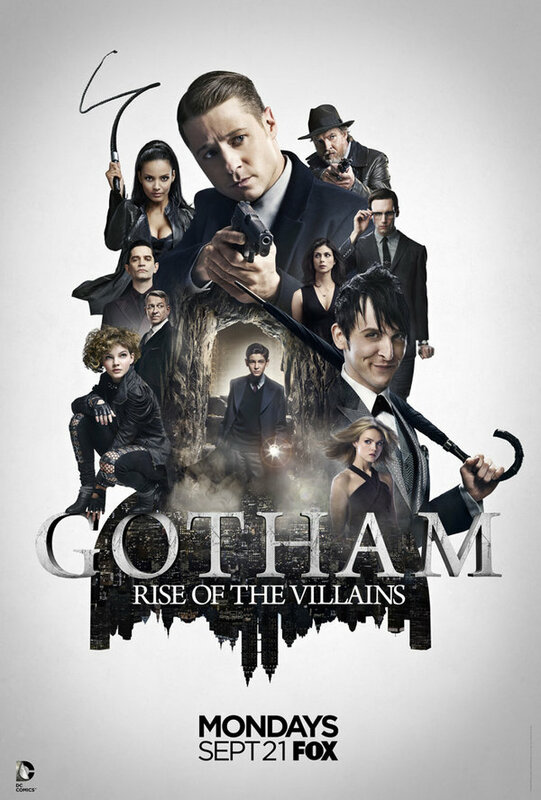 I haven’t been impressed with the superhero shows the broadcast networks have put in front of me. (Netflix, on the other hand is doing some interesting things with Daredevil. And they are planning to come out with Marvel’s Jessica Jones in late November. But I digress. I’m only going through Halloween here.) 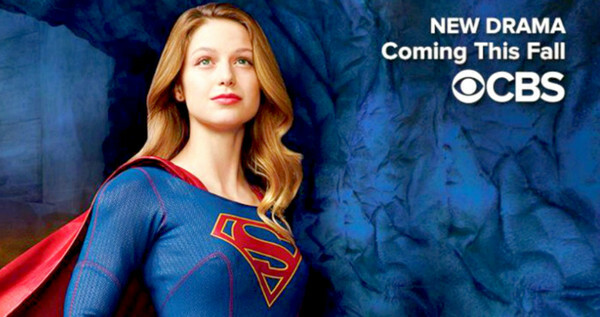 Supergirl is unlikely to be the hero I want anyway. When do we get Wonder Woman? Seasons 1 – 4 are available on Netflix DISCS. This is the one that I missed that ticks me off the most. Why won’t Netflix bring it to streaming? I’d be all over that. 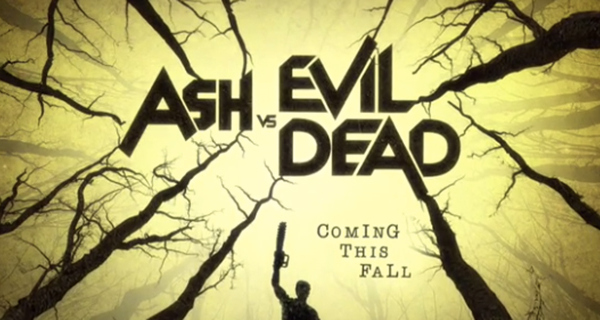 Ten half-hour episodes under executive producers Sam Raimi, Rob Tapert, and Bruce Campbell, the original filmmakers of the Evil Dead franchise. I don’t generally do STARZ listings, but this one caught my eye. 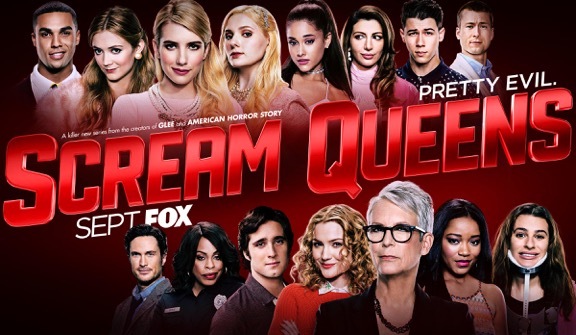 I don’t watch this network, but it appears to be overflowing (like a heaving bosom from a tight bodice) with paranormal / horror / superhero shows — all geared to a younger, hipper, audience than me. Here’s a few highlights, but if these kind of programs are your thing, it’d be best for you to explore the whole CW line-up. 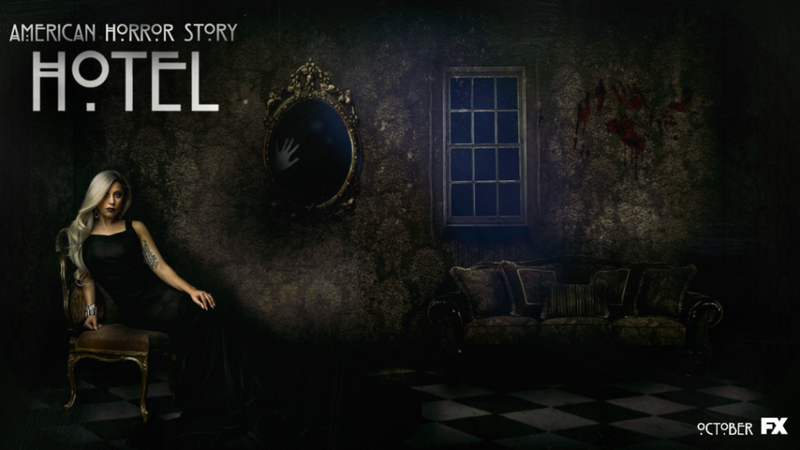 The Originals | Thursdays | 10/9c | Oct 8 ( 3rd season) Vampires & New Orleans!! From Wikipedia: “As of May 20, 2015, 218 episodes of Supernatural have aired, concluding the tenth season. 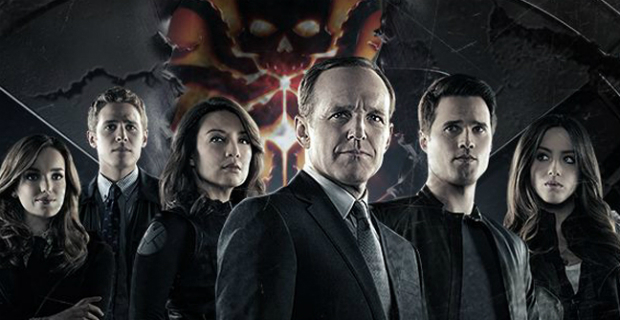 The series has been renewed for an eleventh season, and will premiere on October 7, 2015. Of all the CW shows, I’m most likely to go after Supernatural. I’m in the early stages of my investigation of a suspected haunting in the Carlos Avery Wildlife Management Area, a local nature preserve. Last Friday, I shared the Facebook conversation which inspired me to begin this series, as well as brief sketch of the park’s history. The day after I last wrote about this topic, my husband (aka Ogre) and I visited one small portion of the WMA. Since then, I’ve searched the internet to find any references to paranormal phenomena associated with the area. I am continuing to find and read dozens of old newspaper articles about the park and its environs. 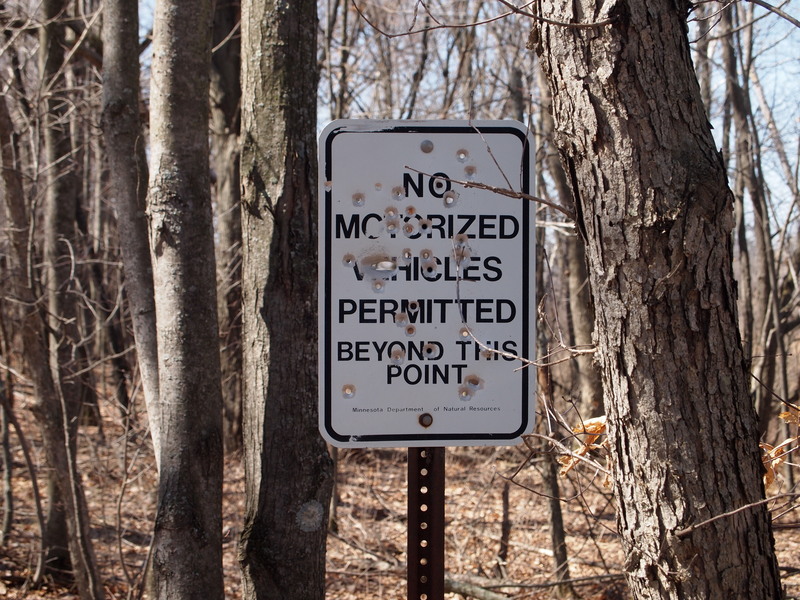 I’ve been driving past, and through, portions of the preserve for most of my life, occasionally noticing small signs meant to identify it, without any real understanding of its purpose. My first order of business was to find out what a “WMA” is. This, then, is not the kind of park most of us are accustomed to. It’s a beautiful area with good access. It provides habitat for a multitude of species, (only a fraction of which are game animals.) I’ve learned that it is a popular spot for birders. But. It is also often full of hunters, many of them inexperienced, who are absolutely intent on killing something. If, like me, you believe that a haunting can be caused by a concentration of negative or harmful intent, or by a saturation of fear or tragedy, then it’s only logical to see how the atmosphere in a hunting preserve could become … tainted. When Ogre and I visited there were no hunters. (Apparently, though, turkey season has since started.) The access roads were closed to vehicles due to muddy areas, resulting from a recent thunderstorm, but we were encouraged to grab a map and walk in. It’s early spring here, so the park felt quite open and well lit. It was quiet, though some frogs were calling from the wet areas. Overall, it was peaceful and pleasant. At no point did I feel unsettled or uncomfortable. Of course, this was just a taste of the WMA, in of one of the most frequently accessed areas of the preserve. I have not yet located the specific sites of the tragedies I referenced in part one of this series, so I cannot say that anything bad or traumatic happened here. I would be surprised if there was even much hunting this close to the park entrance. It does appear that gunfire is common though. It’s important to understand that this is a huge tract of land, ( 23,000 acres,) containing a variety of zones which are dedicated to diverse purposes. This particular WMA includes the Wildlife Science Center on its grounds. 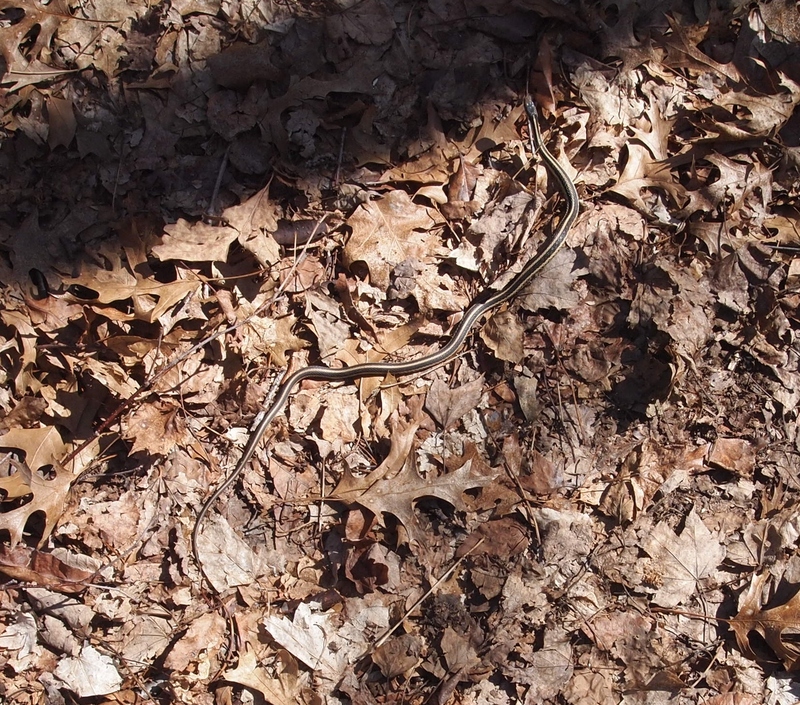 Now, in 2015, the center houses more species than just the grays. I know this not just because I can use google, but because I was once a regular volunteer there. Yes, I’m admitting that I have spent a great deal of time on the Carlos Avery property, without realizing it. “Carlos Avery Game Farm” by Bobak Ha’Eri – Own work. Licensed under CC BY 3.0 via Wikimedia Commons. After you go through the gate, the road curves to the left, past the complex. The section of the property which houses the Wildlife Science Center is composed of modern barns and sheds, as well as the main building, which is just a modified, late 20th century, residential house. Large, chain-link, animal enclosures stretch back into the park, providing homes for animals. 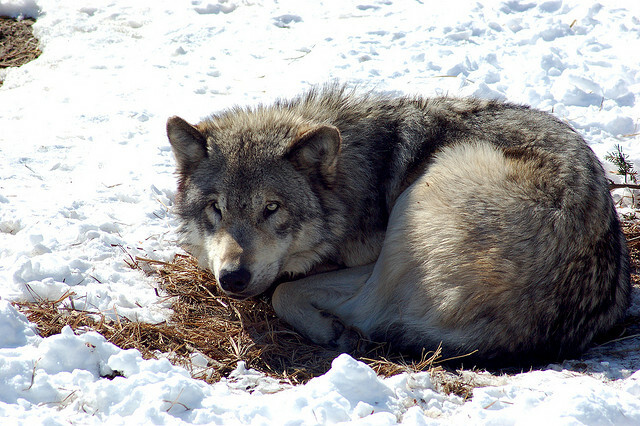 (Resident species include: gray, red and Mexican gray wolf; coyote; fox; bobcat; lynx; cougar; black bear; porcupine; and several different kinds of raptors.) The entire center is well fenced and only open to public tours on Saturdays. I wasn’t permitted to handle the live creatures, (other than the dogs,) though I did once get to stroke an anesthetized adult wolf who was having a medical procedure done. HOW DOES THIS FIGURE INTO THE HAUNTING? All of this is a digression, really. Yes, I did feel watched–even hunted–sometimes when I was moving around in this part of the WMA, but that’s because I was being watched, and watched intently, by large predators who wanted my carcasses. Even when I wasn’t toting a corpse around with me, I still reeked of flesh and blood and decomposition. I’m sure I seemed likely to be quite tasty. I will say this: The wolves (and other canids) like to howl. On still nights, and quiet, overcast days, I imagine their chorus can be heard throughout many acres of the WMA. That sound would absolutely contribute to a sense that the area is haunted. As long as I went off on this tangent, I might as well share one more interesting tidbit about the Wildlife Science Center. Its director, Peggy Callahan, has appeared as a wildlife expert on an episode of History Channel’s MonsterQuest (Swampbeast, 2007, S1E5.) For the show, she devised and conducted an experiment meant to determine how long it takes for the body of a large beast in the wilderness to decompose and completely disappear. My quest for accounts of paranormal events associated with Carlos Avery is only beginning. An internet search revealed two primary legends. In search of the cryptid known as the Linwood Woolly Beast. My best guess is that folks are seeing a large, perhaps albino, deer. If you’d like to know more about the critter, feel free to click on one or both of the above links. I won’t be spending a lot of time watching for the Beast. If I spot him, I’ll be sure to let you know. The second commonly told legend of Carlos Avery is more interesting to me. Apparently several people have reported seeing phantom vehicles in the park. Headlights and taillights are seen shining from areas that are actually inaccessible to a vehicle. (From the middle of a pond, or swamp, or otherwise road-less spot.) This is a legend I can pursue. The WMA is open to visitors from 4:00 am – 10:00 pm. I should be able to legally spend some time driving around in there while it’s dark, once the roads are open. Though I have some feelers out in search of local people who have had unusual experiences in and near Carlos Avery, I haven’t yet been contacted by anyone other than “Rebecca” my original source. If you are reading this page because you searched for information about Carlos Avery after encountering something unexplained in or near the preserve, please contact me to share your story. To remain anonymous, send me a PRIVATE message at my Facebook page. Our conversation will be confidential, and you will determine how you will be identified if I quote you or include your experience in this series. After WWI, the carpet industry faltered, and the land became tax delinquent. Many acres reverted to the state’s ownership. 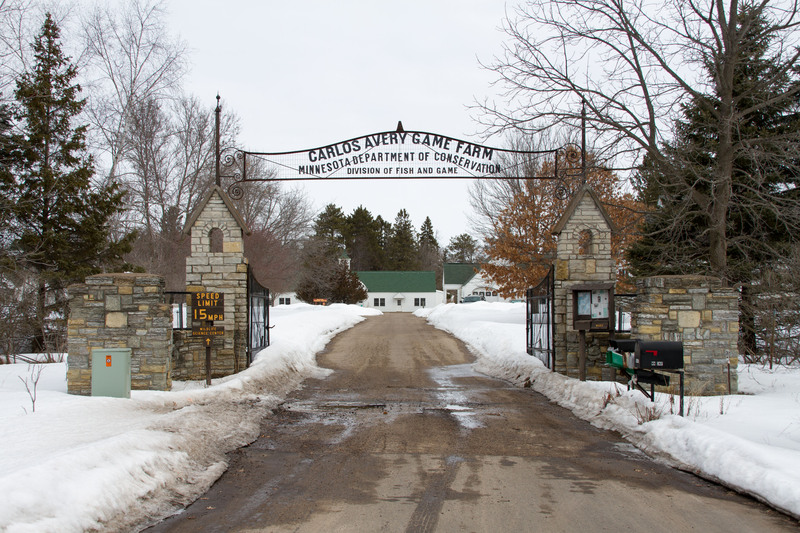 The Carlos Avery Game Park was established on about 8,000 of these acres in 1933. In 1935, the project was approved for WPA status and expanded. Since then, it has been subject to an evolving system of wildlife management. And so ends my speculation about the pre-1933 era. Starting next week, I’ll provide the details of at least one of the historical events that could be contributing to a haunting at Carlos Avery. Availability status updated on Aug 3, 2015. A huge thanks to my daughter, Pooka, for finding this and sharing it with me. [EDIT] Now that I’ve found and added the sneak peek video for the 8th season of Ancient Aliens, though, I’ve got to say the TRAILER (at the very least) is not to be missed. This film has surprisingly good reviews. Not sure how I missed it entirely back in 2010. I forgot to mention Whiplash last week. It’s not horror, of course, but it’s definitely intense and suspenseful. And weirdly inspiring for artist types. O.M.G. This one is fantastic. I’m not even done watching it yet, but I had to pause it so I could come here and add it to the list. Because I missed it on Monday this week, I’ll feature it next week too. UPDATE: It took me a couple of weeks after posting this entry to get to this one, but it was one of the best movies I saw in the month of April. This is scifi with a generous dollop of straight-up horror that takes over the middle of the film … in a good way. I have an issue with A.I. that goes all the way back to A.I. (2001) and this movie did not soothe me at all. There is just no good reason to be pursuing such technology. Decent acting. Interesting visuals. A head full of thoughts when you leave the theater. All in all, a good entertainment value. I cannot wait! This is my favorite sleep aid of them all. I’m catching up with this series this week. I missed it when it came out, but luckily all the episodes are available On Demand through my cable provider. 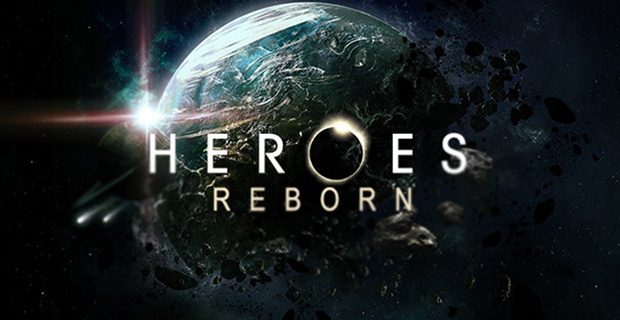 To be honest, I had it confused with ABC’s Resurrection, which I tried and abandoned last year. This show has nothing to do with that. 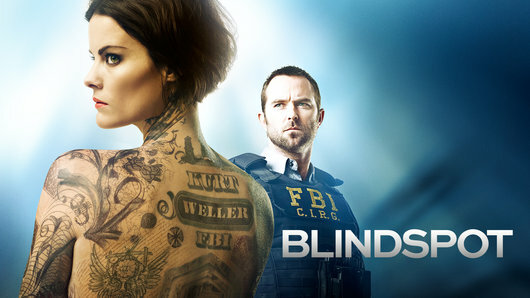 It is an American version of a French television series which began in 2012 and went on to win an International Emmy for Best Drama Series in 2013. I’m three episodes in, and I’m liking it so far. If you have the opportunity to see it from the beginning, give it a shot. This one might have some legs. BUT THERE’S AN UPDATE, OF A SORT: I didn’t go back for it after I wrote the above piece, and now I’ve learned that A&E has decided not to do a second season. That’s the bad news. The good news is that French version has become available on Netflix streaming. So let’s try that again, shall we? Sorry I missed this, Guys. I’m not a Lifetime watcher, but I’m thinking of giving this one a go, because I love Christina Ricci. EDIT: Ok, I’ve given it about 15 minutes. So far I see two characters that I could maybe love, existing in a show that might be too chaotic and experimental for my tastes. The first full episode is available online right now, at Lifetime. The movie that came first is available on Netflix streaming now too. Black = Not yet watched. I’m interested … or I think you’ll be interested. Red = Watched. Not recommended. Worse than the reviews or buzz indicated. Orange = Watched. Recommended, with reservations or cautions. Green = Watched. Recommended. A good movie that lives up to its reputation. When I was formulating the idea for this PDOC series, I began by creating a list of 52+ potential topics which intrigue me. Then I divided them into four categories: creatures, psychopaths, haunts and mysteries. I’m still trying to fill out the list of haunts that I want to explore, but I had no trouble immediately coming up with (more than) 13 mysteries. I always knew that the mysteries suit would be my catch-all for things that didn’t fit neatly into any of the other categories. I also knew it was likely to be my favorite suit. I am fascinated by odd occurrences, strange places and perplexing objects. 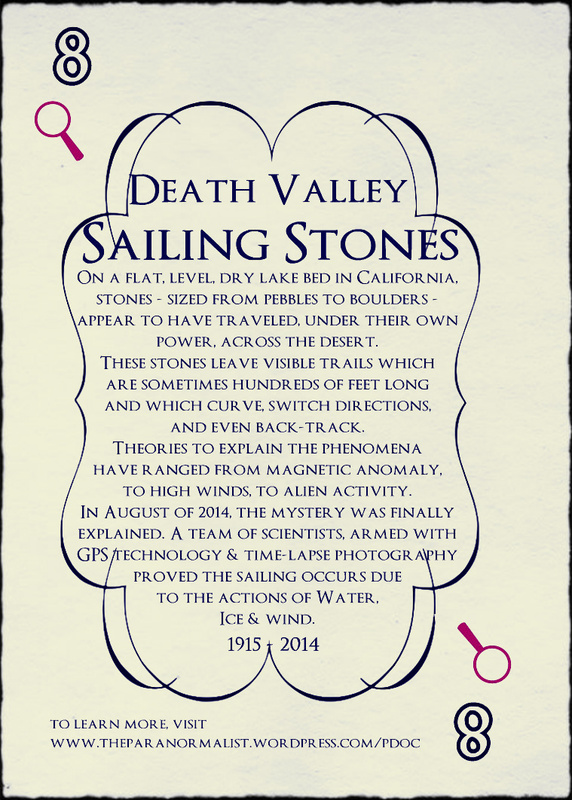 In my initial brainstorming stage, one of the first things I jotted down was the Sailing Stone of Death Valley. At the time, I did not expect the phenomena would be definitively explained before I could even write about it. To be honest, I’m not sure how I feel about this. I certainly did not plan for this project to be about debunking, dismissing, or solving my beloved mysteries. Like many of you, I enjoy knowing that I can’t know everything. I appreciate being wonder-struck and baffled. But I also like to learn new facts and gain increased understanding of how the world works. So I guess it’s all good. 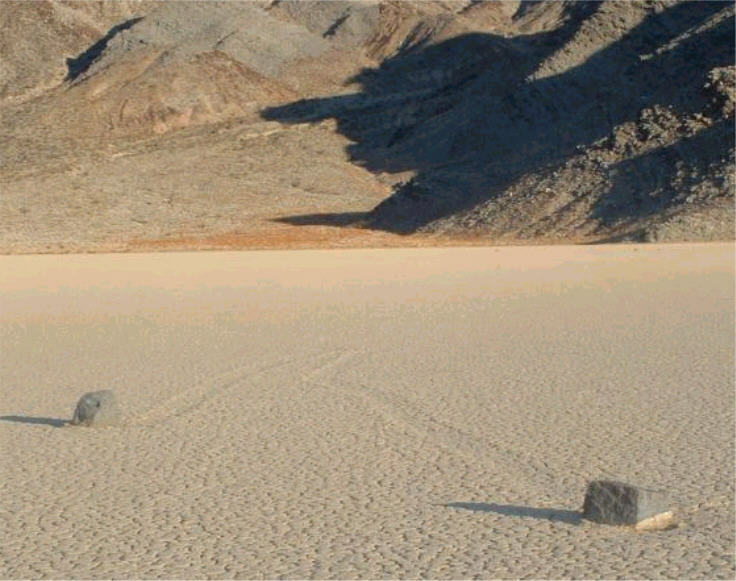 If you’re tapped into the same (or similar) sources of information that I am, you may already know that the phenomena of the Death Valley Sailing Stones has been scientifically explained in the current issue of the journal, Plos One. If you are not connected to such sources, however, you may not even know what all the fuss is about. Let’s start there … with what was known about the stones before a crack team of scientists, armed with the latest technology, figured out was going on. first upload in en wikipedia on 04:23, 28 October 2002 by Maveric149. Licensed under CC BY-SA 3.0 via Wikimedia Commons. In 1915, a prospector named Joseph Crook is reported to have discovered a remote, flat area in Death Valley where stones appeared to have left trails in the desert as they traveled across the barren ground. The mechanism of the stone movement was a mystery. 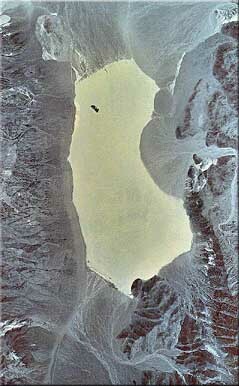 The area Crook discovered is a playa, which is a dry lake-bed. It is a little less than than three miles long and a little more than a mile wide. The playa is extremely flat, with its southern edge being about one and a half inches lower than the northern. Interestingly, the stones often seem to move up the incline, from south to north. The trails inscribed by the wandering stones “are often tens to hundreds of feet long, about 3 to 12 inches wide, and typically much less than an inch deep.” (Wikipedia) Many of the trails are long and straight, but some curve, zig-zag or double back on themselves. These trails are not etched in dust or sand, but in hard-baked clay. One can walk out to the stones to examine the engraved trails and not leave a mark on the ground. Though no one (until 2013) had observed the active movement of a stone, periodic checks on the locations of individual rocks revealed that the they were moving and leaving new trails. HOW FAR DO THEY SAIL? In a study that began in 1972, the location of thirty stones, (with what appeared to be fresh trails,) were marked. Each stone was given a name. Over the next seven years, changes in the stones’ locations were recorded. Ten of the stones moved in the first winter. One, named Mary Ann, moved 212 feet. In two of the next six winters, multiple stones moved. By the end of the seven-year study, 28 of the named stones had moved. The smallest stone to move had a diameter of 2.5 inches; the largest was 80 pounds. One stone – estimated to be over 700 pounds – was named Karen, and it did not move during the monitoring period. It was believed that its original trail, which was 570 feet long and very straight, may have been drawn when it originally tumbled onto the playa. After the study was complete, however, Karen seemed to disappear from the playa. It was rediscovered in 1996 by a geologist who located it about a half mile from its 1972 position. Over the years, multiple theories had been advanced to explain this phenomena. Modern, conventional, scientists has always believed that some combination of water, ice and wind were responsible. It is likely that the inaccessibility of the area during winter months prevented the first people who studied the rocks to think along such lines. The earliest scientific theory was that there was a magnetic anomaly in the area, but this was proved to be unlikely when the rocks themselves were revealed to be entirely non-magnetic. It really is a must-read, if you have a few minutes to spare. It turns out that the modern scientists were right — this is a phenomena caused by water, ice and wind. The following set of photographs was published in a paper entitled Sliding Rocks on Racetrack Playa, Death Valley National Park: First Observation of Rocks in Motion, in the journal PLOS One. Take a look at the stone indicated by the red arrow and compare its position as it changes – in less than 30 seconds – in relation to the two (non-moving) stones indicated by the blue arrows. This was not the only movement observed by this team. Observed rock movement occurred on sunny, clear days, following nights of sub-freezing temperatures. Steady light winds and morning sun caused floating ice to break-up near mid day, accompanied by widespread popping sounds from fragmenting ice panels. Ice initially broke into floating panels tens of meters in size that became increasingly fragmented and separated by open rippled water as melting continued. Floating ice sheets driven by wind stress and flowing water, pushed rocks resting on the playa surface, in some cases moving >60 rocks in a single event. A necessary condition for the rock motion we observed is the existence of a playa pool deep enough to submerge the southern section of the playa, yet shallow enough to leave many rocks partly exposed at the pond surface. Other repeating features of rock movement events that we observed include the presence of floating ice, temperatures and sunlight sufficient to create melt pools in the ice, and light breezes that are steady enough to drive floating ice. Although the ice breaks up around rocks, even thin moving ice sheets can generate sufficient force to drive rocks across the pool. All observed rock movement events occurred near mid-day when sufficient ice melting had occurred to allow ice break-up. Creation of rock trails is difficult to observe because trails form below the ice-covered pool surface where they are often not evident until the ice has melted, and liquid water has been removed. In addition, rock movement is slow and relatively brief—our GPS instrumented stones traveled at speeds of 2–5 m/minute for up to 16 minutes—so casual observation is likely to miss rocks in motion. Weather station data show that the freezing temperatures necessary for ice formation, and winds in excess of 3–5 m/s are common phenomena at Racetrack Playa during the coldest few weeks of winter. Therefore, the extremely episodic occurrence of rock motion (years to decades) is likely due to the infrequency of rain or snow events sufficient to form winter ponds. “Racetrack Playa from space“. Licensed under Public domain via Wikimedia Commons. Daily summer temperatures can reach 120 °F (49 °C). In the winter, the temperature can plunge to 15 °F (−9.4 °C), though the average winter night temperature is closer to 39 °F (4 °C). Annual precipitation is 3 to 4 inches. Note: That second book is actually scheduled to be released on Sept. 16th, 2014. I wonder what they are going to do about the chapter on the Sailing Stones. –Lots of great photographs of the stones and their trails. –I have no prior knowledge of Mr. Sullivan, but in my research, I found his first-person account of a visit to the playa interesting. –31 excellent photographs and some outdated information about two former theories. –The published scientific paper at PLOS One. –the source of the re-assembling, pre-historic, spacecraft theory I mention above. The following video is one episode of a series called Weird or What?, which airs on SyFy and is hosted by William Shatner. This episode is currently available for viewing online, courtesy of the YouTube channel, Documentary Hub. The Sailing Stones are covered in the first segment of this episode, which runs for approximately 15:38 minutes. Note: right now the search engines are flooded with the news that this mystery has been solved. If anyone knows of a documentary made BEFORE the announcement, please leave a comment so I can track it down. This is an early entry in my PDOC series. I’m working on creating the deck’s homepage. If the image above doesn’t yet link to a new page, it soon will. H.H. 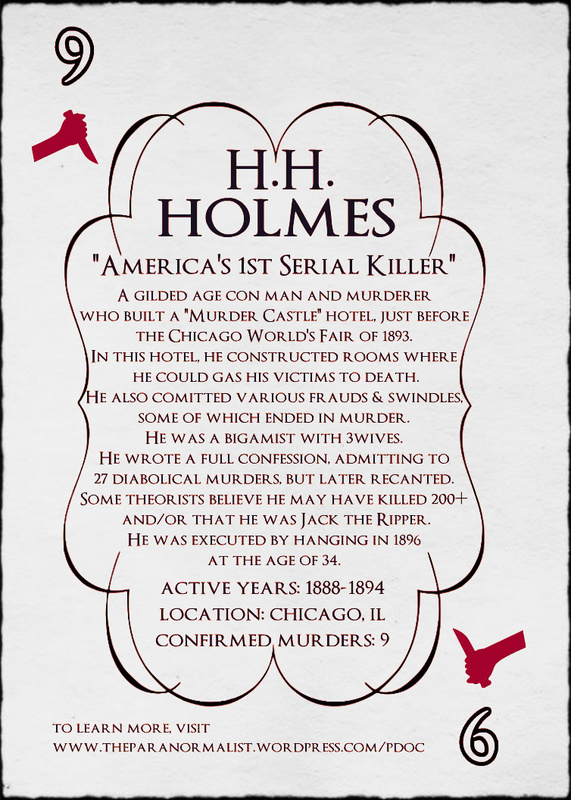 Holmes is considered by many to be the first documented serial killer in the United States. He built a convoluted hotel / rooming house / office building in Chicago just before the beginning of the 1893 World’s Fair. Some of the rooms were designed to be airtight and sound-proof gas chambers. He hired and fired several different contractors to complete the building. One benefit to this behavior was that he was able to avoid paying laborers and contractors by claiming that a firing was due to improperly done work. Perhaps more importantly, for Holmes’ purposes, no one other than Holmes himself really understood the design and layout of what eventually became known as the Murder Castle or Murder Hotel. Holmes killed for two distinct reasons. He is most well-known for the murders of women in his hotel. At least some of those murders seem to have been committed simply to entertain Holmes. He also killed for practical and financial reasons. Holmes was a criminal in many ways. He ran various cons, including stealing bodies from graves, then cleaning and selling the skeletons, as well as insurance fraud schemes which sometimes led to murder. He was also a bigamist that was married to at least three women. Interestingly, he never killed any of the women he married. (Though he did kill a mistress.) He is known to have fathered one child. Some theorists believe that H.H.Holmes was responsible for at least one of the Jack the Ripper murders in Whitechapel, London. Though Holmes and Jack the Ripper were contemporaries, there is no evidence that Holmes ever traveled to England. (It is possible, however.) What little evidence there is, in support of this theory, lies in a similarity of handwriting between letters written by Holmes and those sent to various news outlets from people claiming to be Jack. I am disinclined to believe that a an organized, hands-off, voyeuristic murderer like Holmes would change his signature drastically enough to commit any of the savage, up-close and intimate murders attributed to Jack. Most murders took place during the 1893 World’s Fair. In a hotel he built especially to house the fair goers. Holmes confessed to 27. Nine were confirmed. Some estimates credit him with up to 200 murders. 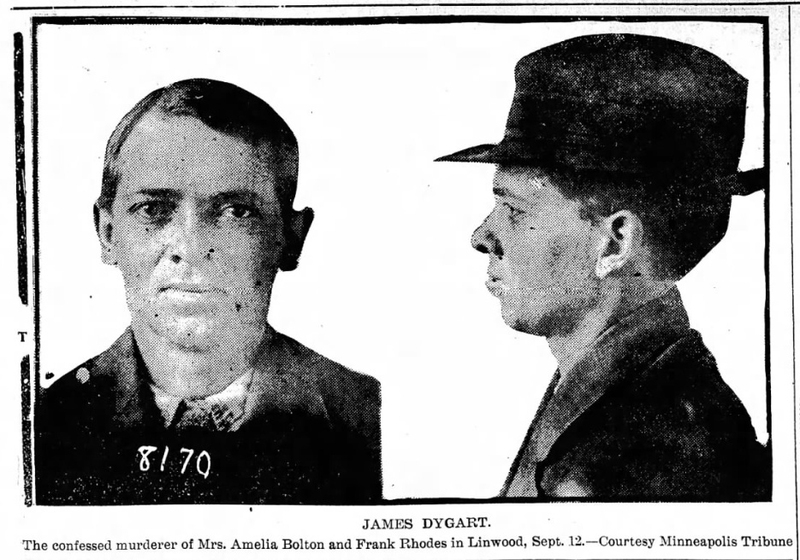 Type B – people, male or female, adults or child, whose death / disappearance benefited Holmes as he played out his financially motivated con games. Convicted of 4 counts of 1st degree murder & 6 counts of attempted murder. Executed by hanging on May 7th, 1896 at the age of 34. Holmes was buried in an unmarked grave. His coffin was encased in a concrete vault to deter grave robbing and / or vandalizing. A Competent Witness by Judith Nickels (at GoodReads) – See comment to this post by the author of this novel. Rumor has it that Leonardo Di Caprio may play Holmes in a film version of The Devil in the White City. It looks like this project has been in discussion for some time, though, and no progress has been made. –This article includes a video tour of some tunnels under a Chicago Post Office that was built on the site of the murder hotel. Some original brickwork may have been incorporated into the newer structure. –five-minute video featuring a possible EVP, by Adam Selzer, for the Mysterious Chicago Blog (aka Chicago Unbelievable). –1 hour and 4 minute documentary that focuses on all of Holmes’ crimes rather than on the World’s Fair, which is mentioned but not detailed. This is more sensationalized than the two listed below. –45 minute documentary which – like the book of the same name – divides its time between discussing Holmes and the World’s Fair. –45-minute treatment of the story from the folks at Biography, plus three shorter video snippets. This is the first entry in my PDOC series. 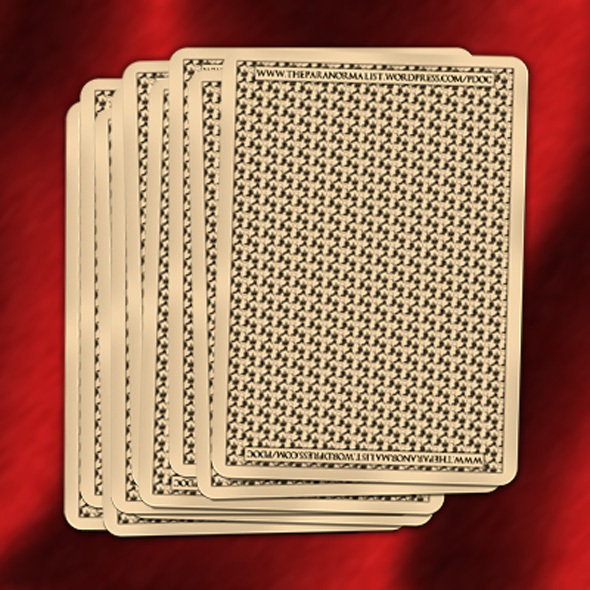 Tonight I’m working on creating the deck’s homepage. If the image above doesn’t yet link to a new page, it soon will. For a couple of months now, I’ve been enjoying the offerings of a channel called MeTV. It’s a haven for paranormal folks, especially old-school types and those of us who … have been consuming macabre media for a while now, and who enjoy a dose of nostalgia. I’m going to be honest, I don’t often watch these blast-from-the-past shows from start to finish. I’ve found the station to be great when I just want to catch a little something while I eat a quick bowl of cereal, or when I’m trying to fall asleep. There is one show, however, that I actually record to watch: Svengoolie. I discovered MeTV, in fact, because I was looking for an old-fashioned Horror Host — someone like Elvira, Sir Cecil Creape, The Ghoul, or Vampira — that I could watch now. I went off on google quest one day and found that I could get Svengoolie via my cable provider, Comcast / Xfinity. I wasn’t looking for stuff that I could watch on my computer; I really wanted something that would be similar to my experiences as a young teen, when I’d watch Hammer House of Horror movies in the late night, or to an even earlier time, when our non-network channel (remember those?) played some b&w syndicated horror host from Chicago on Sunday afternoons. The closest thing I’ve found so far is Svengoolie. I have to say, I’ve seen better. (After all, Mystery Science Theater originated here in Minnesota, for God’s sake. It’s hard to compete with that.) And we’re all spoiled by the slick re-packaging that was done for the the likes of Elvira. Still, there’s fun to be had watching Svengoolie. 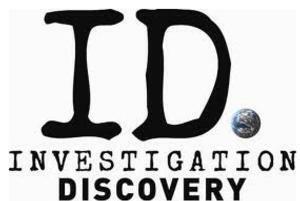 The show is broadcast on Saturday nights, at 10/9C. I have to manage my DVR-ing because my provider doesn’t list the program as “Svengoolie” but rather as the name of whatever movie he’s featuring. With any luck, your provider will be smarter. Find your provider here: MeTV interactive map. I’d love to live-tweet with some of you one night while watching. Let me know if you’re up for it. PS: Because of a fabulous comment that came in to this post, I have to share a video clip of one of the horror hosts, Sir Cecil Creape, at work. Imagine meeting this guy when you’re five. You’d probably scream in his face too … even if he was a personal hero.